After an entirely too short period in Cusco, it was time to move onto the main attraction of this part of the trip: Machu Picchu. 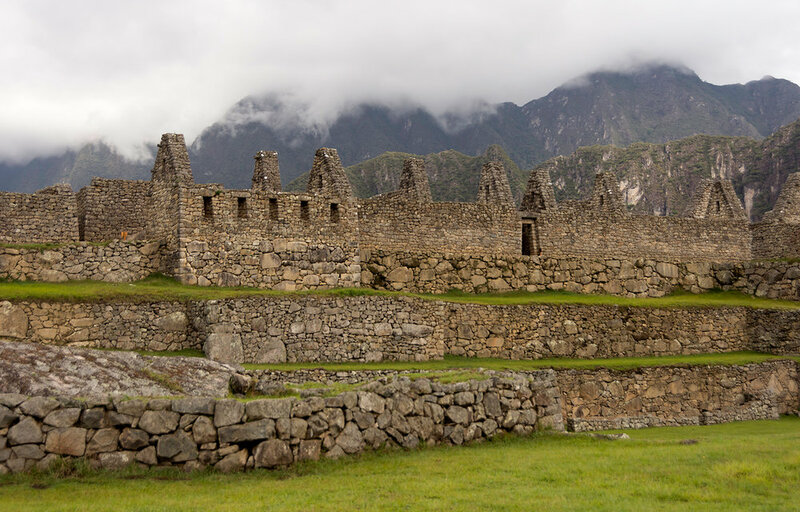 The only way to reach the ruins (in a way that does not involve a multi-day hike) is by train to the town of Aguas Calientes, which takes about three hours. The train ride is very scenic, staying in the high plains between Cusco and Ollantaytambo before descending into the Rio Vilcanota valley via a series of switchbacks. It follows the river from 12000 feet almost halfway back to sea level before reaching its final destination. Unfortunately, while the train was in motion, my position wasn’t great for taking pictures. I was sitting on the aisle, on the closest table to the end of the train, facing a wall. To further complicate matters, there were reflections on the windows which polarizers were unable to remove. I still managed to get a few okay shots from the moving train (including maybe the best look at the Cordillera de los Andes of the entire trip), but nothing compared to what was actually seen. It was a fun, relaxing, comfortable trip. This is Aguas Calientes, the little town in Machu Picchu’s shadow (literally!). The ruins themselves are on one of the side walls of the valley, while Aguas Calientes is on the river about 1200 feet below. Since the only way to reach the town is via train, the tracks run through it like roadways. When you cross the street, you need to watch for solitary engine cabs instead of cars. It’s surreal. The only other motor vehicles in town are the buses to take visitors up to the monument and a scattering of emergency vehicles. And finally, the monument itself. This view of one of the guard houses near the entrance of the park highlights a few of the photographic challenges of the day. The first, and the biggest problem at tourist attractions: tourists. Of course, it wasn’t a surprise (especially since I arrived around 11:30), but at this time getting pictures without other people in it was impossible. You can also see one of several dozen pinch points. 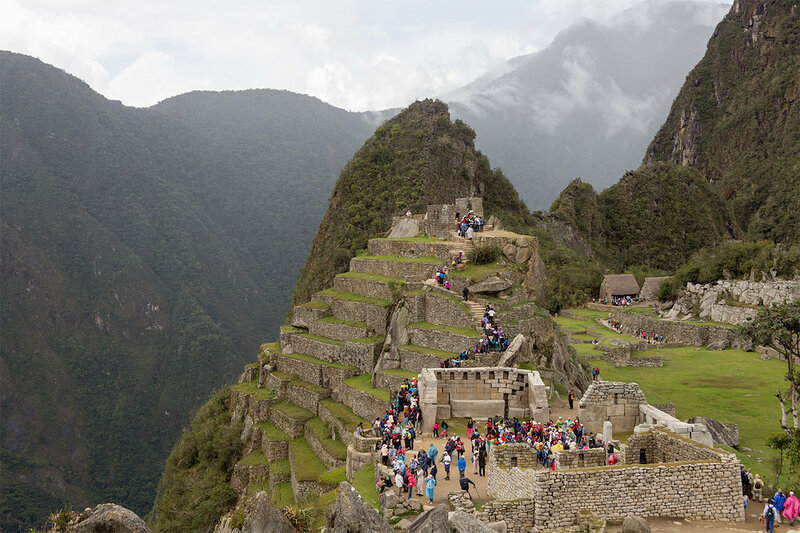 The Inca didn’t think they’d be showing off their impressive handiwork off to 2500 people per day, so traffic control wasn’t exactly a consideration. The pinch point above was forming due to this view, the first truly open one you get of the site if arriving by bus. The scale of this place is just mind-boggling. Most of the site is in good condition or has been restored. However, some of the fringes are still in disrepair. The plan is to eventually restore these sections as well, but for now it’s an interesting look at some of the portions which have not weathered the six centuries of wear and tear quite so well. Looking towards the main square. Note the llamas, including the pair nursing. I also really liked that big tree and tried to include it in about 20 different failed compositions throughout my time there. 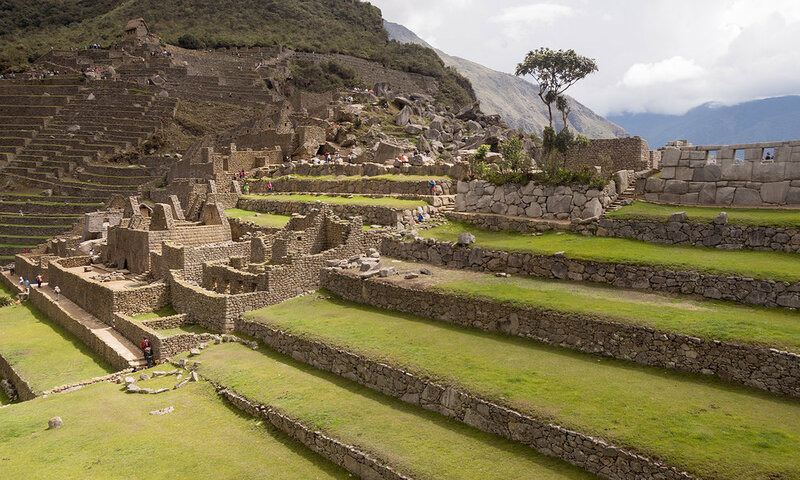 The agricultural terraces at the site are extremely impressive when you consider that the Inca had no heavy equipment to carve out the hillsides. This isn’t unique to Incan farming, of course, but that doesn’t make them less interesting to look at. This is a strange composition and was a very difficult processing job, but I’m still proud of it. And look, some blue sky on the fringes! This is a view of several of the temples on the back side of the monument. In the foreground is the Temple of the Three Windows (the windows are hidden by the direction of the wall, but are visible from other photos later on). On top of the hill is the Intihuatana stone, which served as a calendar when shadows were cast upon it. A narrow hallway between the residences, with the terraces and the guard house visible in the background. A few more from the residences. Out the window on the bottom right you can see all the way down to the bottom of the river valley, near Aguas Calientes. When it’s quiet, you can even hear the river in the far distance (along with train horns, but that’s less romantic). Can you imagine waking up to this view every day? It seems like a pretty good life to me. 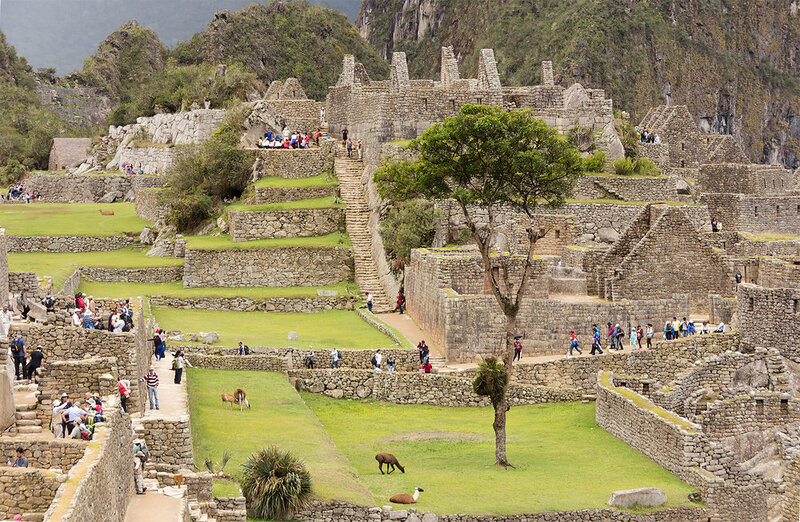 This is one of the most iconic structures of Machu Picchu, the Temple of the Sun. Although the sun wasn’t out at this point, it’s easy to be impressed by the construction (very smooth stones, and again, no power tools). On the solstices, sunlight passes through the windows of this building at sunrise. 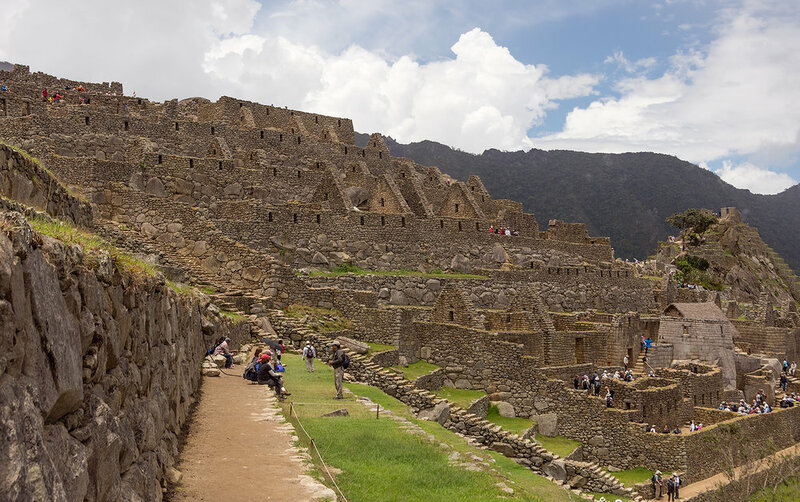 Here are a few shots of the iconic Wayna Picchu. 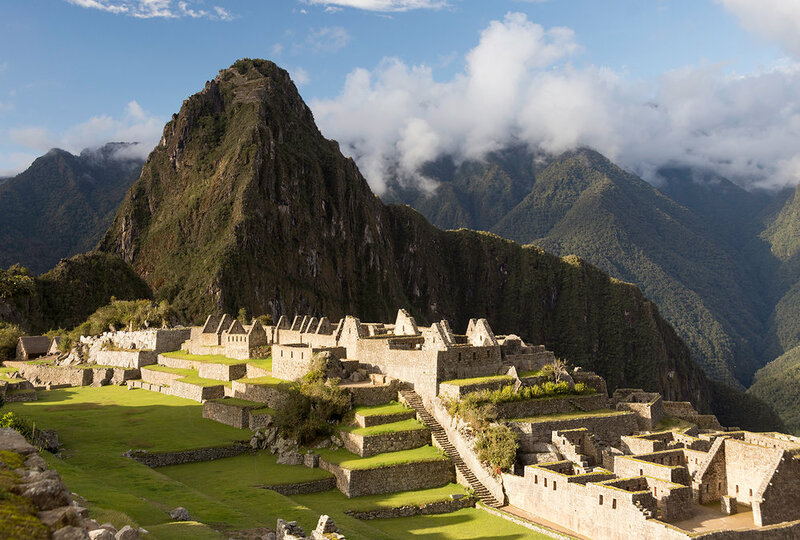 If you’ve seen photos from Machu Picchu before, you’ve seen photos of this mountain. We’ll get much more familiar with it in the next part of this series, but for now it’s worth enjoying from afar. The back side of the ruins, looking towards the main entrance. Many of the main landmarks are visible. The windows of the Temple of the Three Windows can be seen on the top right. The residences are on the left. The Temple of the Sun can be seen on the left edge, near the center. The guard house is at the top left. It’s not one of the most iconic views in the park, but it’s one of the few from which you can see almost everything. Unfortunately, the sun was still playing games, but sometimes we can’t have everything. At this point, the sky was really starting to close in. The thunder, which was audible in the distance for the past two hours, was finally drawing near. I crossed the park (and its many, many stairs) as quickly as I could, and got to the enclosed dining area just as the clouds opened up. The downpour lasted half an hour, just long enough to eat an overpriced sandwich, but the break in the day left me with an important decision. At this point, it was about 3PM. I had pre-paid for a pass to the Machu Picchu museum, located in the bottom of the valley near Aguas Calientes, which was only valid on this day. However, I wasn’t feeling particularly satisfied with the photos that I’d taken, and the park was still open for another couple of hours. I eventually decided to skip the museum, despite already having paid for it, so I could have some more time behind the viewfinder. This decision paid off dramatically. The first impact was immediately obvious: the rain had cleared out a significant number of people from the park. At first the sun was still not cooperating, yet again hiding behind distant storm clouds. Still, this grass house and flower near the entrance was very pretty. After the tourists began to clear out, it was clear who really runs the place. Terrible light, but I enjoy this picture of the Temple of the Sun (with one of its windows), the temple adjacent, and the guard house watching both of them from above. At this point, I started wandering towards the back of the monument. It was mostly empty, affording opportunities that I didn’t have earlier in the day. On the left are some of the houses overlooking the town plaza, and on the right is the Sacred Rock. Some patches of blue were fighting against the overcast, hints of events to come. This is the Temple of the Condor, named after the wing-like shape of one of its walls. Historians believe that this was used as either a temple or a prison, quite the range of possibilities. The first picture also features a well-placed chinchilla. And finally, my luck changed. Machu Picchu rightfully gets a lot of attention for its architecture, but what is often overlooked is the incredible scenery surrounding it. It’s the Andes and the Amazon squished together into one spectacular package. A giant rainbow appearing over those hills drove that home, even though I wasn’t in a great position to photograph the ruins in the foreground (you can see my feeble attempt of doing so below). 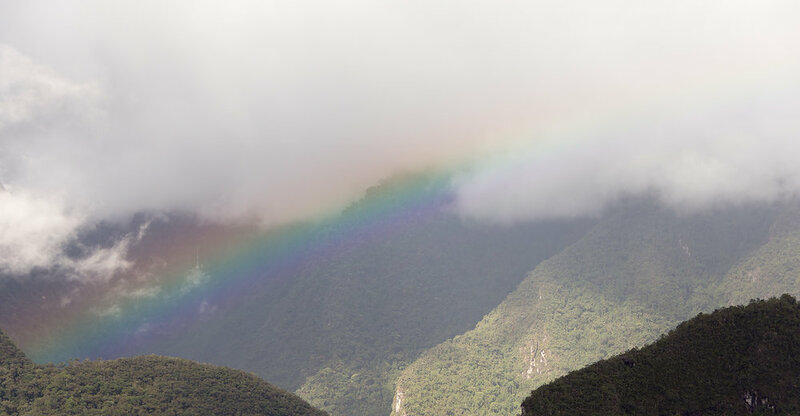 With the brilliant green valley, the giant river running through it, the rainbows, the storms, the sun, and the light, it’s hardly any wonder that the Inca worshiped the elements. Wouldn’t you? And finally, there was Machu Picchu’s parting gift. The late-afternoon light finally hit the monument in all of its glory, with the surrounding clouds providing an amazing background. At this point, five minutes before they started kicking people out for the day, I almost had the park to myself. Patience was rewarded with just about the best conditions possible. What a moment. That’s it for day 1 of Machu Picchu. The next set of photos will be from my second day at the park, and features photos from an extremely different perspective.